Crossrail’s contractor, Hochtief Murphy JV, has now completed the ground engineering for the Plumstead portal that will take Crossrail’s slurry TBMs below the River Thames. The last diaphragm wall panel marked the end of six months of intensive ground engineering utilising varying methods of piling, diaphragm walling and grouting. The works have seen 2,300t of reinforcement fixed on site and 22,000m3 of structural concrete poured using five rigs at peak activity with a combined workforce of 70 from Skanska Cementation and HMJV. 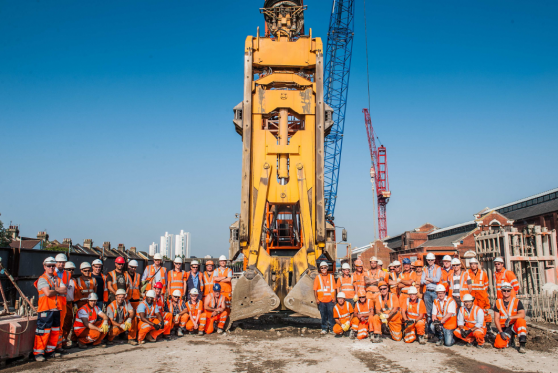 The greatest achievement has been the completion of the works within 3m of the North Kent running line with up to 16 train movements per hour. The close working relationship with Network Rail was a key factor in ensuring the success of the works and has set a new benchmark for the installation of large scale ground engineering in close proximity to live railway infrastructure. The next phase of works will involve bulk excavation of the portal and propping works in preparation for the arrival of the TBMs later this year.